First, we had the Internet Era, when a few people could publish online and e-commerce is born. Then came the Social Media Age, when anyone could publish online using social tools, including brands. The digital communication floodgates were opened. Today, many companies are trying to get their arms around the Collaborative Economy, as customers use common technologies to create and share products using P2P commerce. People increasingly get what they need from each other. 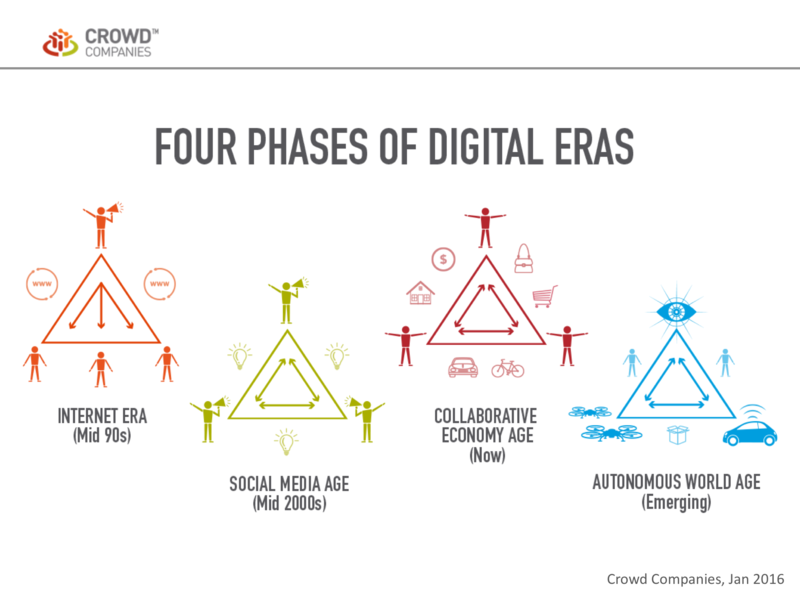 But, our digital evolution doesn’t stop with the Collaborative Economy. While we’re deepening our understanding of sharing behaviors, service marketplaces, and the Maker Movement, the next digital era is emerging: the “Autonomous World.” (See below image) In the Autonomous World, we see machines replace humans to deliver even greater convenience and efficiencies. The Collaborative Economy lays the necessary foundation for the Autonomous World to thrive. How, exactly, does the Collaborative Economy lay the groundwork for new business models in the Autonomous World? In the Collaborative Economy, people often access what they need from each other, rather than buying products for ownership. By gaining access to products and services through on-demand business models, customers reduce the need for ownership. Autonomous technologies like self-driving cars are going to extend the access model, by enabling cars to be hailed on-demand rather than having to own vehicles. Here’s an example: we’re already seeing the foundation laid for autonomous vehicle penetration in the ride-sharing and carpooling market of the Collaborative Economy. These services have grown significantly in recent years, with more than 11 million people in the United States utilizing ridesharing services today. By seamlessly ferrying customers at the tap of an app, Uber, Lyft, BlaBlaCar, and others contribute to our increased preference of vehicle access over ownership. Eventually, when drivers are ousted in favor of autonomous cars, riders will experience more efficient routes, increased safety, and reduced transportation costs. That’s right, the human drivers, whether they be taxis or Uber drivers, will be cut out by robots who can do it better. Alphabet (formerly Google) is leading the way, currently working on a ride-hailing service that utilizes its self-driving car fleet, while GM is close behind with its recent $500 million investment in the development of an autonomous fleet utilizing Lyft’s platform exclusively. When intelligent technology systems operate with minimal human participation in the application of driverless cars, all industries must adapt to an inevitable transformation of societal behaviors and expectations. At Crowd Companies, we’re exploring these disruptions and impacts as our members chart new territory within their innovation programs. I look forward to getting your feedback and would love to explore how our innovation council can help you weather the autonomous disruptions that lie ahead.